1/23/19 – Many new technologies are introduced to the world with untold hype and fail to live up to their promise, both in terms of promised improvements and user adoption. This has not been the case for AM. As an industry, Wohlers Associates calculated that it has appreciated 21% in 2018 to a market value of $7.3 billion . An estimated 1,768 metal-based AM systems were sold in 2017, compared to 983 similar systems in 2016, which is an increase of ~80%. In response to these and other reports, 3-D printing cybersecurity startups have emerged, such as 3DP Security (founded by Dr. Nikhil Gupta of New York University’s Tandon School of Engineering) and Identify3D (cofounded by Joe Inkenbrandt and Stephan Thomas). Additionally, the Danish company “Create it REAL” has developed a platform for encrypting and decrypting 3-D files onboard a 3-D printer. The main goal of this company’s work is IP protection, but it also has the potential to mitigate malicious attacks by preventing file alteration . Underlining these IP concerns, recent filings by the Walt Disney Company show that it has filed a patent for 3-D printing with antiscanning filament, citing concerns that their figurines and models could easily be copied using 3-D scanning and printing . The hope of the company is that this threat can be mitigated with a new 3-D printing process (although, it is noted that a potential low-tech solution to this would be possible with a scan of dulling spray paint). In 2016, the Digital Manufacturing and Design Innovation Institute (DMDII) in Chicago launched the National Center for Cybersecurity in Manufacturing, which focuses on the risks to AM through $750k seed money from the Pentagon . DMDII held a Cybersecurity in Manufacturing Workshop to provide a forum to educate interested parties. The most recent of these was held on September 25–26, 2018, at the University of Illinois Labs Innovation Center. 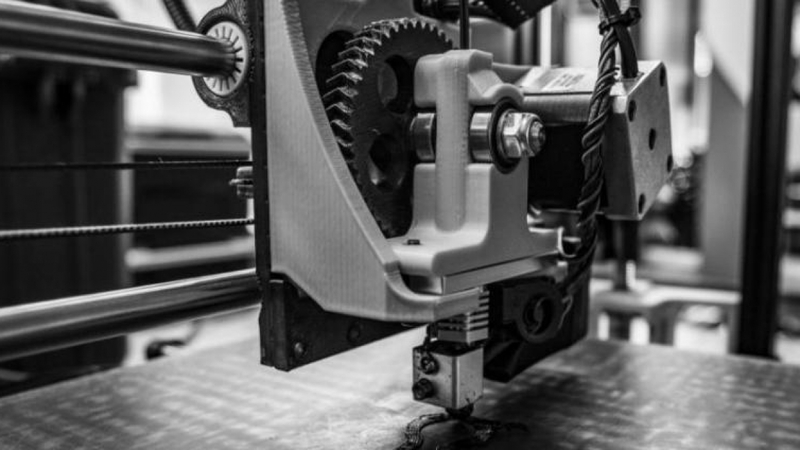 Another group that started in 2014, the National Defense Industrial Association, formed a working group called Cybersecurity for Additive Manufacturing, with several different joint working group teams. These teams included the following: (1) the Manufacturing Environment Team (run by Dr. Marilyn Gaska of Lockheed Martin), (2) the Policy Planning and Impacts Team (led by Ms. Sarah Stern of the Boeing Company), (3) the Technology Solutions Team (led by Ms. Heather Moyer of Atlantic Broadband), and (4) the Reference and Integration Team (led by Ms. Catherine Ortiz of Defined Business Solutions, LLC). Yet another group, the Cyber Secure Dashboard (started in January 2017), jointly created with the University of Illinois Urbana-Champaign, Lockheed Martin, Heartland Science and Technology and others, was instituted to develop an assessment tool to help small and medium-sized manufacturers in complying with U.S. Department of Defense-mandated control requirements . Blockchain technology is being used to secure the digital thread to 3-D print file data to implement software and validation tools through the AM process. A blockchain is a growing list of records linked using cryptography. Each record contains a cryptographic hash of the previous block, a timestamp, and transaction data; this technology is incorporated into Bitcoin technology. Two companies spearheading these technologies are Identify3D and Cubichain Technologies.